Talking to children about God. “By God, you mean Jesus, don’t you?” I asked. “Is Jesus God or the son of God?” she asked. She was satisfied with my answer and I, pleased to be able to give her a satisfactory answer – the result of a childhood spent sampling various religions and an adulthood punctuated by countless Bible studies. Having said that, I’ve often wished she could be SECULAR like me. For while religion is worth knowing, it is a body of knowledge like any other. I discovered her spiritual inclinations when her pre-prep (that’s kindergarten for those of you outside of Oz) teacher came to me to report her inordinate time spent PRAYING in the school’s sand pit. Yes, you read correctly. She was PRAYING in the school sand pit. What was more astonishing was that she got her best friend, Lily, to pray with her, also in the school sand pit. “What were they praying for?” I once asked their teacher. Now you know why we, parents, become lifelong friends of our children’s pre-prep teachers. They know too much about us! Since then, Amanda’s been insisting HRH and I pray before mealtimes, a habit she picked up from my now church-going parents. She chides us for “lack of manners” and “not remembering God” when we start eating before she’s finished her lengthy sermon. Often, it incorporates something she’s just learnt; while we were in Malaysia, it was poverty. She sustained huge scrapes on both thighs from the fall. Bigger hurts like a broken neck or a broken heart. Today, it’s a fall from a school wall. Tomorrow, it might be a fall more spectacular; one that I, as a parent, can’t prevent any more than I could the fall from the school wall. I wanted her to know that in every aspect of life, we are given a choice. For God to stop us from doing something, however silly or self-sabotaging it may be, is to take away that choice. For instance, I choose to be secular and it has particular consequences: Amanda and I have arguments because she’s more worried about my lack of eternal salvation than I am. “Oh, is that what the mumbling I hear every night is all about?” I asked her. I hope when she grows up she doesn’t assume we’re all going to hell because we believe other than what she does. If there’s one thing I constantly stress to her during our talks is that God is love. We can split hairs until the cows come home about how this love manifests itself, but God is peace, God is hope and above all, God is love. With that, let me wish you a Happy Good Friday and a blessed Easter! Have a good one! A weekend trip to Margaret River, Lonely Planet’s top 10 regions in the WORLD. Can you be on a diet and enjoy Margaret River? Sure you can. All weekend long, I drank wine, ate cheese, gorged on chocolate, stuffed my face with gourmet meals and came back 1 kilogram lighter! In fact, if I were to formulate a dieting program, mine would involve a week’s stay in this food and wine lover’s paradise. Listed as one of Lonely Planet’s top 10 regions in the world to visit for 2010, Margaret River is still as charming today as when Lonely Planet decided to alert the world to its many splendours. There are so many picturesque vineyards, gourmet producers of food, art galleries, heavily-forrested bush-walking trails, bejewelled caves and soft-sandy beaches to chose from that a weekend is simply inadequate to discover everything Margaret River has to offer. Be that as it may, HRH and I, tagging Amanda along as usual, made up our minds to see as much as we can in the space of 36 hours, allowing for time on the road and a good night’s rest. Our first stop in Margaret River was at the ever-helpful I-site centre, where we were suggested, nay ordered, to sample Clancy’s Fish Pub. And boy, was she right! 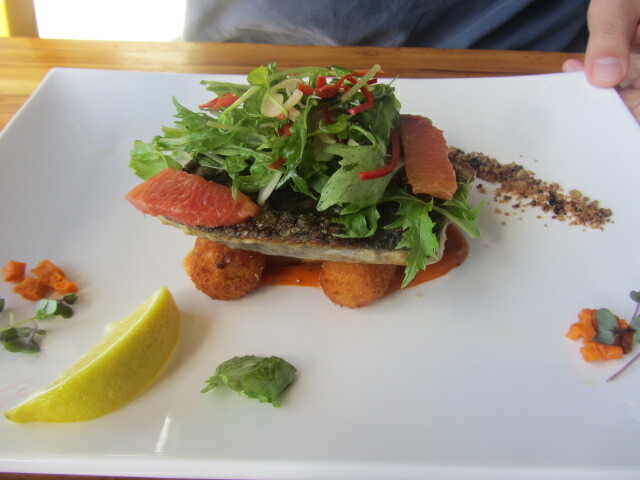 The fish was so fresh you could smell the ocean on it even after cooking. The prawns tasted the way real prawns should, instead of like those rubber bullets coming from China. What a place to sit and eat your fish and chips! 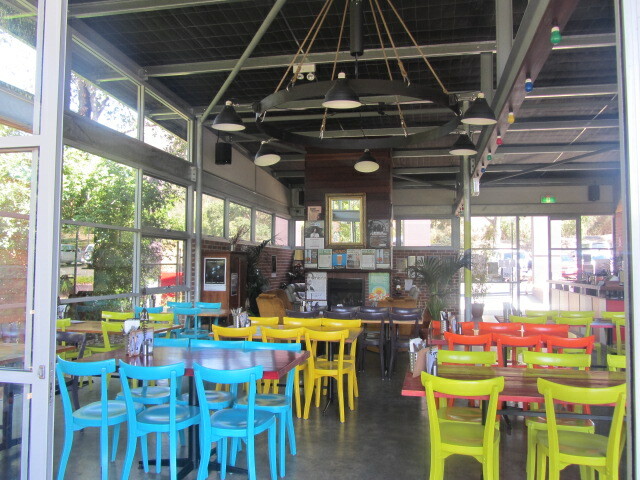 Bright and cheerful furnishings at the Clancy’s Fish Pub in Dunsborough. In front of us, prawn and crab bisque, closer to the camera is pan-fried line-caught snapper. Only 3 prawns and 3 TBS of crab but packed full of flavour. 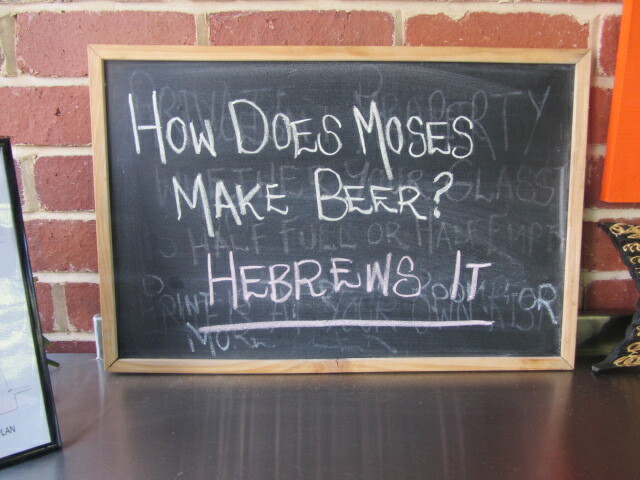 Here’s a joke for the Christians. After lunch, which I might add was utterly delicious but not very filling for $80, we stopped by Simmo’s Ice Creamery. There, befuddled at the endless “delicious dilemmas” as Simmo’s puts it, I had a small cone of cherry ice cream, whilst HRH had an adult-sized single scoop cone of pistachio ice cream and Amanda a kid’s size cone of her regular strawberry ice cream. The total for all 3 ice creams? A very affordable $11.80. How does one choose from so many flavours? Delicious dilemmas alright! How about a few rounds of golf after all that ice cream? At Simmo’s you can ! From Simmo’s Ice Creamery we ventured to Yallingup beach where we saw surfer dudes and dudettes suiting up to catch gigantic waves. Miles and miles of pristine shoreline – a sight that is infinitely better in the flesh. Bad hair due to strong winds at Yallingup beach. Can’t complain other than that. After Yallingup beach, our stomachs were growling so loudly we had to swing by Gabriel Chocolate to refuel. Ignoring the House of Cards Winery next door, we made a mad dash to the Cheese Factory to sample some of the finest cheeses and shiraz jelly made in this region before they closed their doors for the day. A picture of Gabriel Chocolate in Margaret River, Western Australia. Maybe next time. A picture of the House of Cards Winery in Margaret River, Western Australia. It’s worth the $6 I paid. B far the best hot chocolate I’ve ever had. It’s a good thing she can burn the calories. There are probably 2000 calories in that one drink. It cost me another $6. Since Margaret River is very popular on the weekends, with some B & B’s booked for weeks in advance and charging up to $340 per night, not knowing any better until we got there, we booked a quaint two-bedroom cottage in Karridale, a half hour’s drive from Margaret River proper. 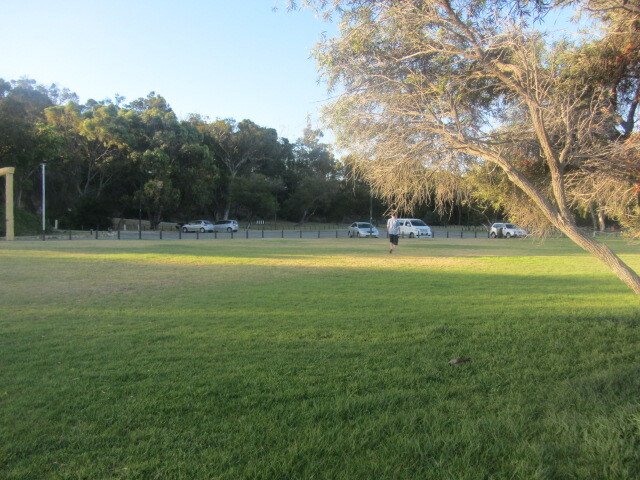 Our accommodation, Karridale Cottages, costing $165 per night, offered plenty of “country-living” activities for visitors but because we spent the whole day checking out the gourmet food producers in Margaret River’s north and middle, only arrived shortly before bedtime. See all those trees around us? 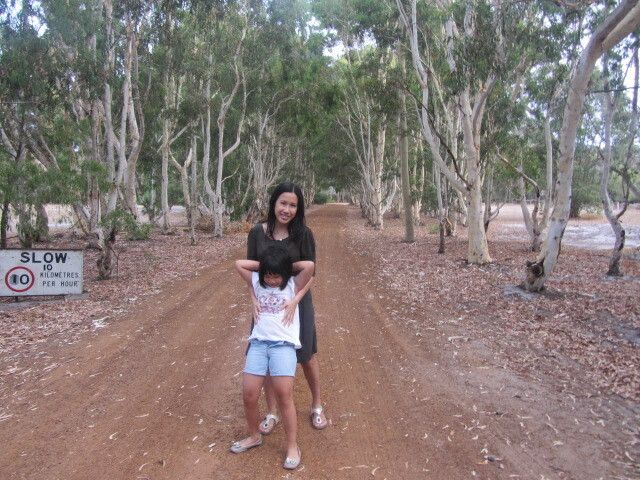 We could have gone bush-walking! It’s a 2 bedroom, eco-friendly hut made out of rammed earth. The water coming out through taps is collected rain-water and the whole place runs on solar energy. The next morning we broke our overnight fast with the $33 worth of cheese we bought from the Cheese Factory. It was such a heavy, if satisfactory meal, it lasted us our trip to Cape Leeuwin further south, where the Southern Ocean meets the Indian Ocean, through the magnificent Booranup Karri Forests and a 45 minute minute down into the bowels of Calgardup Cave and back. By which time we were glad we hadn’t signed up for the $50, 3-cave-deal, at Jewel Cave near Karridale. Shrouded in mist. Approaching Cape Leeuwin lighthouse. I once saw this in a friend’s travel album on facebook. Seeing it in person brings the rugged beauty of the place to a whole other level. We’re with Mr Cow, enjoying the vistas of the magnificent Cape. Last few metres. A picture of HRH and Amanda walking towards the Cape Leeuwin lighthouse. It costs $5 per person to tour the grounds and $17 per person to ascend the lighthouse. It feels like standing at the edge of the world. 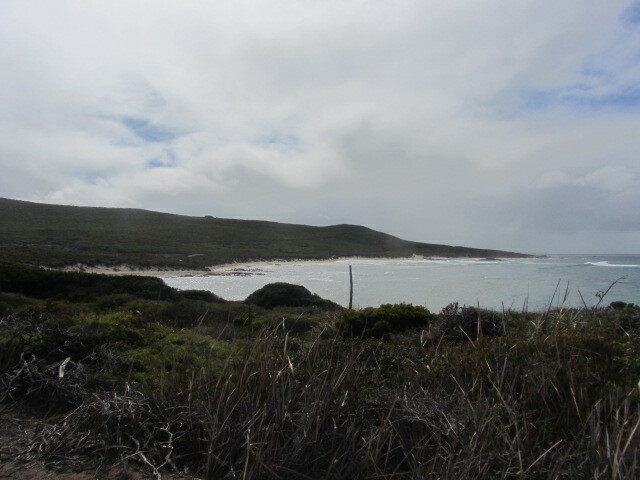 A picture of where the Southern Ocean meets the Indian Ocean at Cape Leeuwin in Western Australia. Karri trees are some of the tallest, if not the tallest trees, in Western Australia. The Booranup Karri Forests is said to be at par with the Amazonian jungle in terms of biodiversity of plant species. 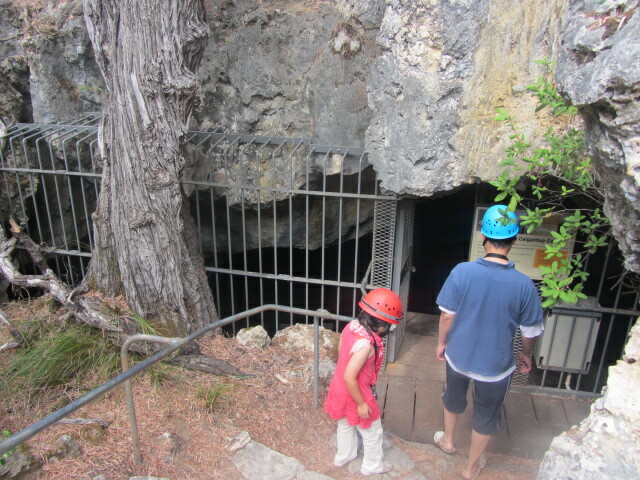 It cost us $30 to go visit the Calgardup Cave. At one point, in total darkness and with the ceiling the height of my waist, I was convinced I couldn’t go on without hitting something. This is one of the more “family friendly” self-guided caves. I recommend it for families with children over the age of 6. A the default camera person, I had no photo. We’re not supposed to touch even an inch of the cave as the grime on our fingers inhibits future crystal growth. See what I mean about the ceiling being my waist height? After all that physical activity, we felt deserving of another Margaret River gourmet experience, so we headed over to Leeuwin estate for a wine-flight and some lunch. This deck overlooks perfectly manicured lawns and Karri forests. Line caught pink snapper on crushed chorizo sauce. 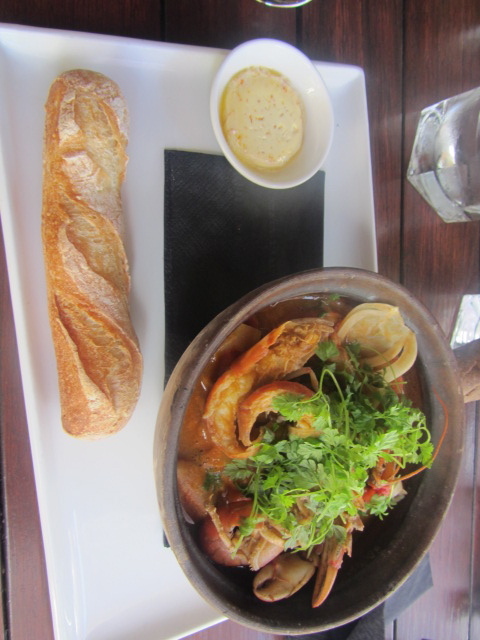 Claypot yabbies with fennel in a bisque. With our eyes bigger than our stomachs, we went in search of desert after lunch. 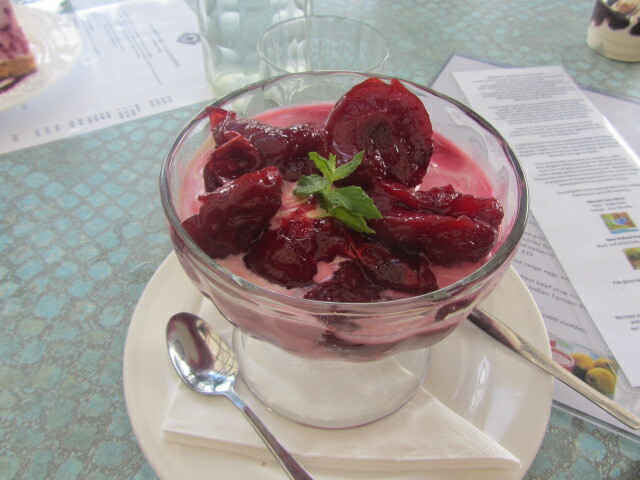 We found our way to the Berry Farm off Rosa Glen Road where I had a generous serving of plums poached in Merlot, served with Margaret River ice cream, and HRH had berry cheesecake. 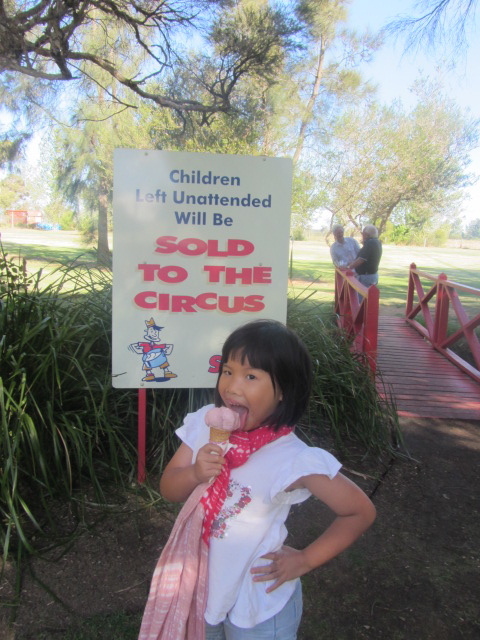 For once, Amanda preferred riding the flying fox in the playground to food. Well, who came blame her? We ate to within an inch of bursting! But rest assured, we’ll be back to visit Margaret River again. Did I mention I lost 1 kg with all this eating? Planted in honour of the founder of the Berry Farm. 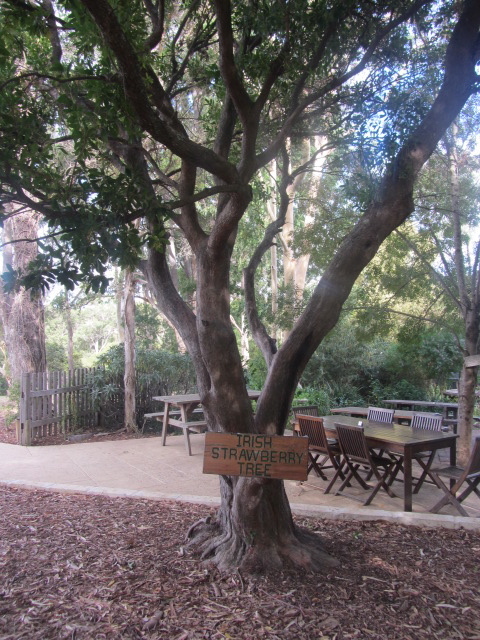 A picture of the gardens at the Berry Farm in Margaret River, Western Australia. There was no more alcohol there but I felt drunk all the same. The cheese was light and fluffy, yet the biscuit base so buttery. I’m sure there were 1 million calories in there but it was worth every bite. Should we educate girls even if some just end up housewives? A much younger cousin of mine was going to attend Melbourne University. 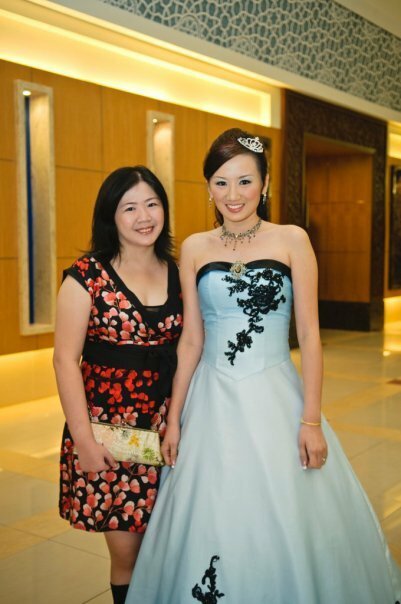 To my surprise, she chose instead to study at a local college in Malaysia, even though her parents can well afford to send her to Melbourne University. Because this is the age of facebook and myspace, and because she was, quite literally, in diapers when I last saw her, I asked her publicly why the change of heart. She explained she’s still going to Melbourne University, except instead of going there directly, going to have her credits transferred over, which to my knowledge is impossible as Melbourne University does not admit transfer students into its programmes, unless the university transferred from belongs to the prestigious Group of 8. That may be true because for a Malaysian, it costs on average RM300 k for a 3 year arts or commerce degree, RM650 k for 4 year engineering degree and well over RM1 million for a 5 year medical degree in Australia. To many, that’s an amount saved over a lifetime. Besides, it’s not like we can take that money to see Gow Wong Yeh, Lord of the Underworld. We’ve got to spend it somehow and why not on our children’s education, if our own retirement is assured? “Not everyone is so ambitious.” He cited one of his friends who became a housewife straight after earning her engineering degree, which to me implied her education was a waste. As anyone of you will know, he might as well be referring to me. I make no bones about it: I’m an educated woman who stays home. I’m friends with other educated women who also stay home. In today’s very expensive world, most women have to work but we are a very fortunate exception. We are John Howard’s “Doctors’ Wives” – that demographic of EDUCATED, OPINIONATED women who swept Australia’s second longest serving Prime Minister into power and kept him there for 11 years 267 days. It isn’t just functions and outings you’ll be seeing your spouse’s colleagues’ wives at, members of the same profession, for some mysterious reason, all tend to live in the same area and send their children to the same schools. They visit the same supermarkets, dine at the same restaurants, go on the same type of holidays. Think of all these highly educated, very opinionated women talking to each other. One tries to engage me in talk about state and national politics every time I enter my local health food store. Another has just introduced the concept of volunteering to children in Amanda’s school. This explains why Malaysians, indeed most Asians, are of the opinion that educating a girl just to be a housewife is a waste. It’s a waste because someone uneducated can do the same job. But ask yourself this: is the scope of housewife-ing limited to domestic drudgery? Why then do working mothers want to leave their children with maids who speak English or send them to childcare centres where they will receive appropriate developmental support? When you educate a girl, future housewife or Prime Minister, you are educating an entire family. You are not just educating 1 generation, but many generations to come, for the effect of education is not just residual but cumulative. Take Wang Leehom’s paternal grandmother for example: a 90 something year old university graduate who helps her famous grandson pen those love songs I adore. Was her education a waste? To hint at a wasted education just because a woman has no career to show for it is to belittle our contribution to our families and the communities we live in and to underestimate the REAL value of women everywhere, doctors’ wives or not. I was at the dentist yesterday, having my twice yearly check-up and clean like a good girl, when, between being X-rayed and scaled, the dentist and I got chatting about the many capital cities of Australia. For those of you who skipped Geography in school, there are 8 capital cities, also known as metropolitan areas, to match the 6 states and 2 territories. You might think they are one and the same, given the deep anglo roots of this country, but having lived in, if not visited, all of them, plus many country towns along the way, I can safely say that each are characters in their own right. Darwin for instance, is the Hawaiian-shirt wearing clown of the bunch. Sydney is the primped and pedicured, brand-wearing fashionista. Melbourne is the late-twenty-something-year-old connoisseur of cafes and culture in the occasional pea coat. I see them all personified and dressed differently because as a woman, clothes are what I notice. It’s been said that women dress for each other and that is generally true. The dentist, a terrific-looking blonde from the U.K., who’s only been in Perth slightly longer than I have, was mainly interested in Melbourne and Brisbane. “What’s there?” I asked, after she asked me to gargle with the minty-flavoured water. One of my Brisbane buddies went to Melbourne for a work conference and came back telling me she felt like a flamingo at the Hilton, dressed in red with slivers of pink. “It’s like the U.K. then,” says the dentist. I wouldn’t call it that since many living in Melbourne have never been anywhere near Europe. It must be the grey skies then that convince people to dress in sombre colours. I’ve also seen many cars go over the curb in an attempt to get into a side-parking instead of doing a proper parallel park. A jeweller in Nedlands told me that’s because like most Melbournians, I tend not wear what I own. It turns out there’s still something left of Melbourne in me after so many years of living away. But I’ve since decided to do as Romans so in Rome and give my outfits a final flourish of bling because everyone from school administrators to the lady who owns the consignment store across the road, treats you better when you wear something that temporarily blinds them. Or if you’re the kind dentists have trouble shutting up, you just make your own like me. Cairns, an old friend with a new haircut. Can our children be anything they want or are they hampered by our imaginations? It all started when Amanda was 2. My small family of 3 were at Yama, then Cairns’ most popular Japanese restaurant, when Amanda suddenly got up and began singing and dancing, using the raised wooden platform we were seated at as a stage. The other diners were good sports, clapping and cheering after her impromptu performance, calling for an encore. Being Amanda’s mother, I was proud of her, if somewhat flustered by all the attention. “Fine,” I said with a chuckle. After all, who takes 3 year olds seriously? She continued to sing anywhere and everywhere, first thing in the morning and last thing at night, and often being her only audience, I clapped and cheered on cue. But I still didn’t take her seriously. After all, good Chinese girls usually grow up to be whatever their parents want them to be; an example of this is myself, but for a lack of career commensurate with my qualifications. Surely given my non-too-subtle hints about suitable career choices, which at times made me sound quite like my own mother, her answer would be something sensible. My suggestions can be traced back to my own childhood when there was an often-spoken, if unofficial, list of “acceptable” careers for the average Chinese person. In the order in which they were preferred, they were: doctor, lawyer, engineer, accountant, architect. Pre Y2K, anything to do with computers was added to the list. Over the years, banking and finance-related careers were also deemed desirable, if still after options 1, 2 and 3. But singing? Being an “artist” in the lose sense of the word myself, I can relate to Amanda’s need to create, to perform. In fact, many of our friends in the 4101, our neighbourhood in Brisbane, belong to the arts scene. One hosts her own TV show, “Love TV.” Another is an international opera singer. Yet another designs and makes jewellery for a living. But the arts, like sports, is a winner-take-all type arena; those who manage to belly-crawl to the top get all the money, all the recognition, whereas everyone else struggles to find work and make ends meet. As a professional, you may never be rich, but if you’re any good at what you do, you’ll make a decent living. The problem is I am a born worry-wart. What will I do if she insists on singing for a living? I blame myself for showing her too many youtube clips of Wang Leehom on stage. If you’ve never heard of Wang Leehom, you should google him. He’s an object of adulation for women between 8 and 80 all over Asia. Here’s one of my favourite videos of him singing live in Taiwan. More years passed. Recently I asked Amanda again what she wants to be when she grows up. “A singer, doctor, writer and Prime Minister,” she answered most self-assuredly. Notice her first choice? Why, it’s still the same! Now I don’t want to be one of those parents that kill dreams but how many Chinese you know join shows like Australia’s X-factor or Australia’s Got Talent? How many Chinese emerge as stars in the West? Is the world ready to hear Chinese sing or perform in any language other than Chinese? I look at Wang Leehom. Born in the States, he had to return to Taiwan, where his parents are from, to realise his dreams of stardom. Would singing or acting have been his parents first choice of a career for him? Being of professional stock like they are, I don’t think so. Even Wang Leehom achieved a perfect GPA score before embarking on a singing career. One needn’t burn the books just because one is no longer going to read them as all education has residual value. Secretly I’m hoping that by the time she finishes university she’ll have forgotten all about singing. Based on the number of concerts I’m subjected to weekly, there’s a fat chance of that happening. Oh well, it doesn’t hurt to dream. Bridging the divide: a visit from in-laws. My in-laws left yesterday after a week’s stay with yours truly. They were here for sister-in-law’s (SIL) first entry into Australia as a permanent resident. For those of you who’ve migrated to these parts, you’ll know what this first entry and do-not-enter-after-this-date business is all about. For those of you who haven’t, it just means she has to enter the country. If you’ve read some of my past posts on my relationship with the in-laws, you’ll know that we haven’t always gotten along like the cliched house on fire. In fact, at some point in my close to 12 years of marriage to HRH, our relationship was so explosive, our house may have caught on fire. But that’s all water under the bridge now. Being a lion (he is a Leo) HRH wanted me to be magnanimous; proud but forgiving. Picture Simba from Lion King, standing on the edge of the cliff before his animal subjects and you’ll know the pose I was asked to adopt. Ridiculous, isn’t it? As a lioness (I am a Cancer with 4 planets in Leo, hence my rapport with HRH), my main priority is to protect my turf and everything that lies within it. Forget that and you’ll feel my claws in your back. But time has a way of making even the most ferocious of us mellow. It’s as if, through the looking glass, what was once so important, is not as important any more. All of us are 8 years older and as the events, or rather non-events, of the week have proven, 8 years wiser. I no longer need to demarcate the boundaries to my territory with the blood of fresh kill because everyone can see the caked blood. Like anyone new to a group or situation – be it workplace, family or social organisation – I was eager to establish myself, eager to show that “you’re NOT the boss of me.” But as I said, time, and little children (Amanda) have a way of softening the hardest of hearts. When you see how the in-laws fuss over your child, indeed any person who fusses over your child, you tend to look at them with more empathic eyes. Watching the in-laws talk to and play with Amanda, I had so much empathy coming out of me that I was my most magnanimous self. I cooked them 4 dinners in a row to a theme of “Welcome to Australia”, burning my forearm when I stupidly yanked out a rack from a heated oven, I took them to my favourite French Patisserie in the neighbourhood for buttery croissant and freshly-made coffee, I even drove out of Nedlands, my village, which I’d never driven out from since moving in (I only drive around the area) to take them to Fremantle, so that they wouldn’t have to catch the bus. More amazingly, father-in-law (FIL) and I had many conversations, NONE of which ended in one of us saying we are no longer related after this visit, which has happened before. FIL seemed to still want us to move back to Malaysia but was respectful of our decision to continue living here. At the end of the day, time, a child and many hours of talking have given us the secret ingredient for a decent relationship: mutual respect. FIL gave HRH his medical degree and I gave HRH everything that came after that. I just wanted FIL to know what it is I do in our relationship, that his child is in good hands. 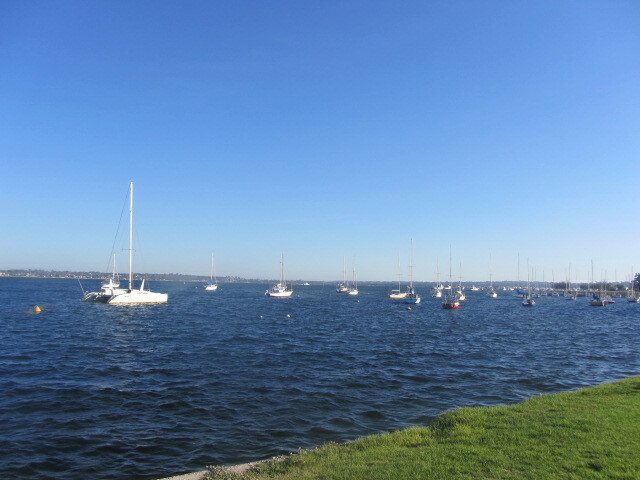 All around us were perfectly manicured lawns; in the river, sparklingly clear waters with yatches bobbing on them. To most Asians, anything with the word “bar” in it serves beers and cocktails. I was about to say shooters, pre-mixes, stubbies and vino but realised that whole mouthful would be as perplexing to the typical Asian reader as the phrase “milk” (for babies) “bar” (for adults). We also have “uni bars” on most university campuses too; which actually serve alcohol, which I allowed my parents to discover for themselves, lest they worry about my prior commitment to hit the books, on the day of my brother’s graduation, a decade ago. In addition to the milk bar, my street also has a “Laundrobar” – no, no alcohol here – also fondly known as a “wash house.” Why? I’ve absolutely no idea, except that you should bring a king’s ransom in $1 coins to use the machines. Some wash houses have crude but serviceable coin machines, giving you the much needed gold rounds in exchange for your notes, however some, like the one along my street, only has a soap powder dispenser. We also have noodle bars, sushi bars, all sort of bars that have nothing to do with drinking. If male, you probably should also learn the difference between a “broad” and a “sheila” before stepping into any of these places, especially in you are intent on snagging (chatting up) someone. A sheila might look like those thong-wearing women you see on postcards, whilst a broad might look like the mother of those thong-wearing women. They both refer to women obviously, just different sorts of women. And they said Asian languages are hard to learn. To your relief, you may also be pleased to know that Horse Sauce, which goes wonderfully with meat pies, has no horse in it, just tomatoes and loads of sugar. Same goes for “Bangers and Mash”, a favourite of all little people (children, not midgets) right around Australia, which is code for Sausages and Mash Potatoes. We’re also very fond of our Sausage Sizzle here, a stall set up to raise funds for whomsoever the stall owner says they are raising funds for, almost always selling freshly cooked beef sausages served on white bread with an optional serving of blackened onions. A fantastic start to the day. 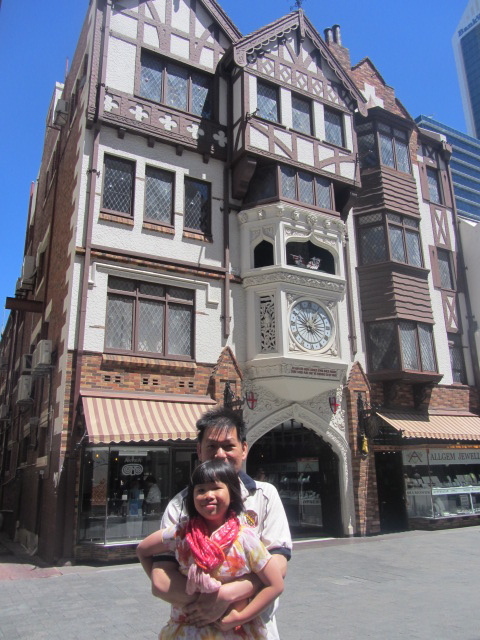 Our first month in Perth. Since a picture paints a thousand words, I’ve decided to allow a selection of photos I’ve taken this month do the talking. Do enjoy! 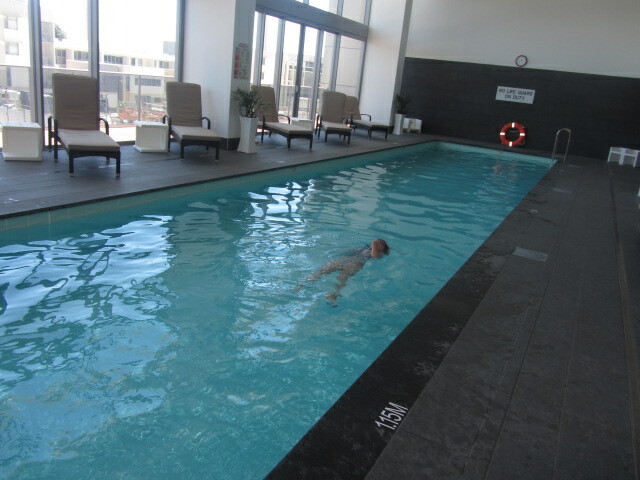 Amanda’s swimming teacher would be so proud of her. She can now swim 25m freestyle and backstroke, do tumble turns and recently mastered survival backstroke too. Who says tasty can’t be healthy? 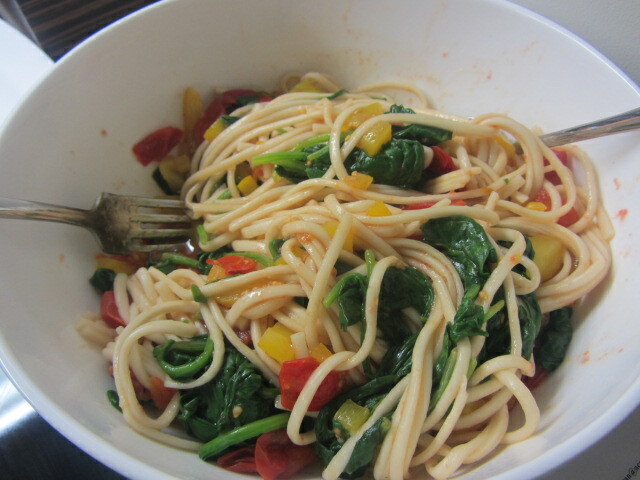 This bowl of noodles captures the essence of summer with of punnet of grapes tomatoes, 1 yellow capsicum and 200 gms of spinach. It’s low in fat but high in flavour. My little Aussie has a sausage roll to start the first school day of the year. Here come the dragons! Please welcome the snake year! T’was 42 degrees on the day but we were glad we braved the heat to be part of the festivities. Picture of the crowd taken by HRH, who seemed to be the tallest one there. You can tell how much sun there was by how tan I am. 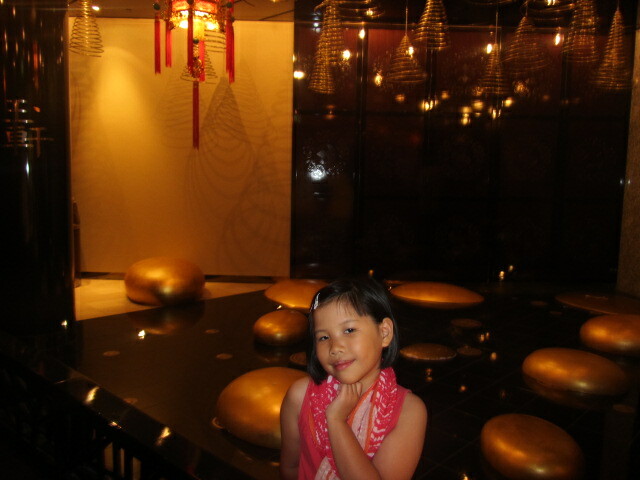 Since I bought Amanda a sam fu in Singapore, she could dress up for this year’s Chinese New Year with me. 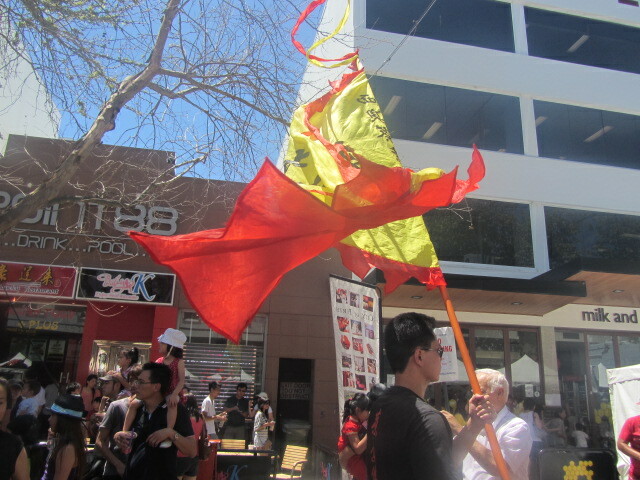 It was the Chinese New Year but we had every race known to man at that street fair. 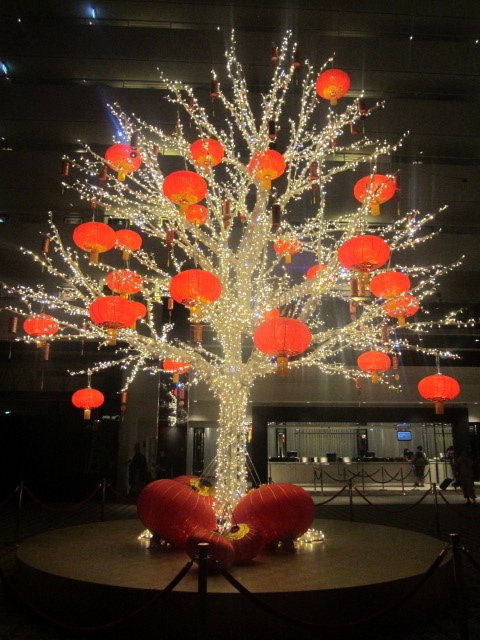 What Chinese New Year is complete without Choy San, God of Prosperity? Here he comes to give out red packets with gold-colored tokens to children. 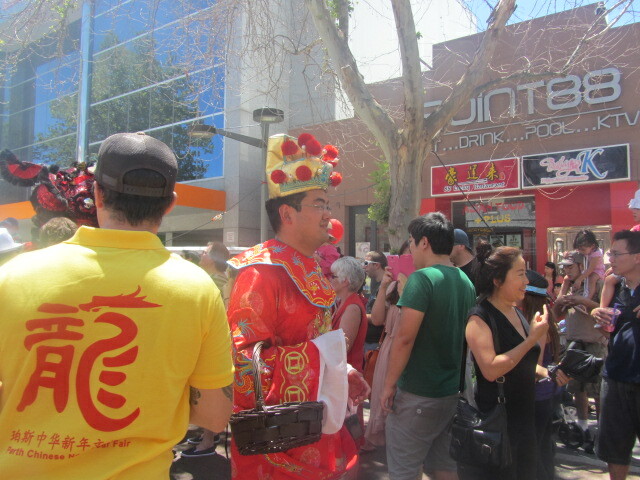 You wouldn’t believe it but the lion dancers were Latin Americans! Bite-sized pieces of Nyonya kueh were real good. 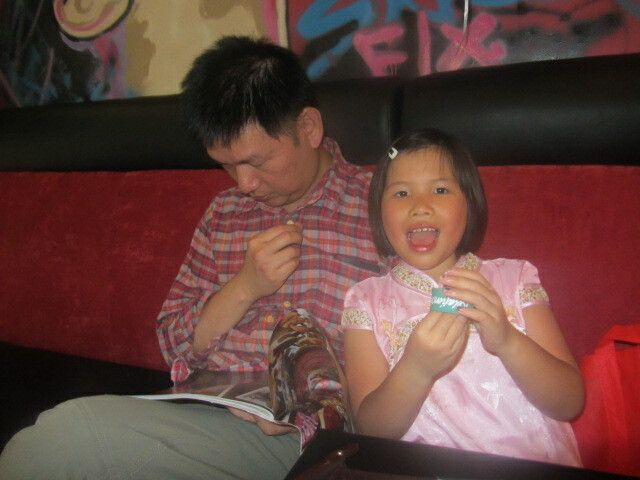 To escape the 42 degree heat, we ducked into a desert shop along the main street in Northbridge, Perth. Amanda enjoying a ride on her new two-legged scooter. Another lovely evening in Perth. You can always admire the yatches even if they don’t belong to you. Snow crabs look better than they taste. These babies here were destined for someone’s Chinese New Year feast. Having a light moment in a regular shopping centre. Such lush grass at the Nedland’s Esplanade. If only I could cart that tree home. I reckon it’d look marvellous in my lounge. That building in the background is a hotel. 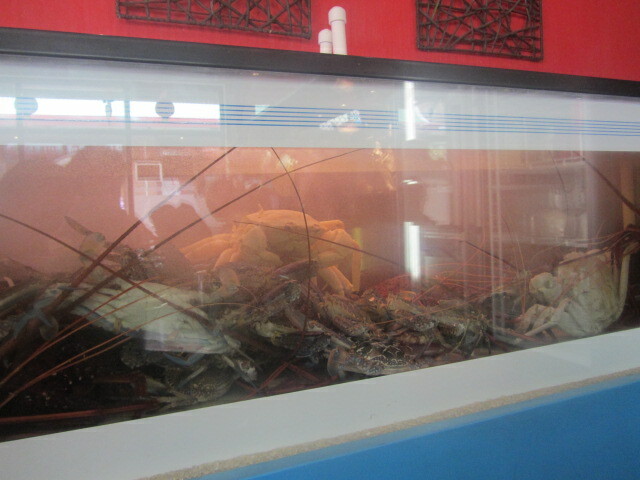 Capitalising on the Chinese’s love of gold and money, this restaurant has both as part of its decor. Not sure about the spiral josticks hanging from the ceiling. 10 out of 10 for presentation and taste. 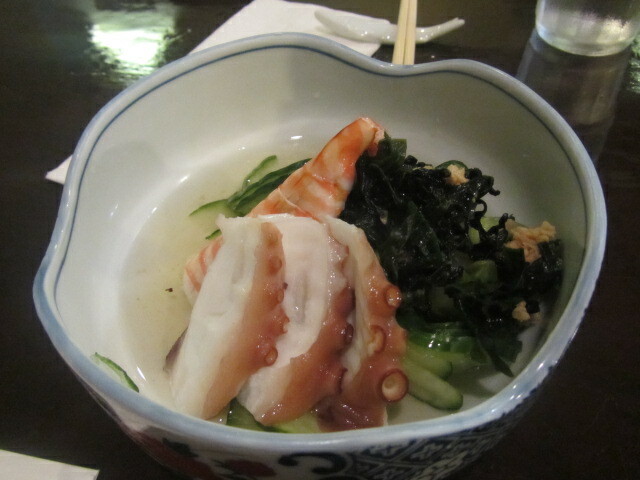 A picture of the Sunomono we had at Kido Japanese restaurant in Nedlands, Perth. “If I don’t learnt to skateboard now, then when?” asked HRH before buying that hazardous contraption. Enroute to buying me a new handphone. A picture of HRH and Amanda in Perth City. A picture of the wall at Gino’s in Fremantle, Perth. Gino’s is a gastronomic institution in Fremantle, Perth, that started long, long, long ago when a Italian tailor dreamt of opening a coffee shop selling good coffee. Today the place has coffee, a wide selection of cakes and perfectly-cooked main meals.